Please find below releases issued by Attacq. Please direct all media enquiries or interview requests to mandy@attacq.co.za. Tuesday, 5 March 2019. Attacq Limited (“Attacq”), a South African-based REIT today announced an interim dividend of 40.5 cents per share for the six months ended 31 December 2018, which is well in line with guidance. Subsequent to the REIT conversion in May 2018, the company paid its maiden dividend in October 2018, therefore there is no prior period comparative for the interim dividend. Attacq’s distributable earnings per share increased by 9.5% to 45 cents per share, as a result of the completed developments generating additional income and growth in the dividend received from MAS. Attacq’s net asset value per share (NAVPS) decreased by 2.39% from R24.24 at 30 June 2018 to R23.66 largely due to the full year dividend payout of R520 million in October 2018 and the impairment from the Rest of Africa retail investments. Attacq’s high quality South African portfolio is valued at R21.0 billion which, at 75% makes up the majority of the group’s total assets. The portfolio comprises 52.5% retail, 37.9% office and mixed-use, 7.9% industrial and 1.7% hotel. The Company received two MSCI awards for the 2018 top performing South African portfolio in the office and industrial sector based on three-year annualised total return. The retail dominated portfolio saw rental escalations of 7.1%. The weighted average lease expiry profile at December 2018 was 6.8 years, compared to 7.1 years at December 2017. Total rental income increased by 12.4% to R1.0 billion, which is largely due to the additional rental income from the buildings completed during the 2017 and 2018 financial years. Attacq’s overall portfolio vacancies decreased to 5% from 7.7% at June 2018, mainly as a result of securing the Dis-chem lease for our industrial warehouse and leases concluded at Gateway West with Sage and Spaces. Subsequent to 31 December 2018, vacancies reduced to 4.6%. The Company will be participating in the Edcon’s newly announced recapitalisation programme. Attacq’s effective South African Edcon exposure will settle at 22 945m² of PGLA by 1 October 2019, with effective gross monthly rental at R3.2 million; and the total PGLA exposure estimated at 3%. Attacq’s involvement in Edcon’s recapitalisation programme will negatively impact its 2019 financial year distributable earnings by R4.1 million. “We have worked hard in order to reduce vacancies by securing new tenants. This was achieved by adopting a proactive and solution-driven approach which assists in mitigating future risk in the changing property sphere, especially in the retail sector”, commented Jackie van Niekerk. The total value invested in developments at Waterfall has increased to R2.6 billion, up from R2.3 billion at 30 June 2018. This includes buildings under construction, remaining development bulk as well as the industrial bulk in the Sanlam joint venture. The increase is a result of capital expenditure and fair value adjustments on developments under construction due to the progress of the developments. The number of developments under construction at 31 December 2018 comprised a total PGLA of 83 896m², 57 431m2 of which belong to Attacq. “We remain focused on Waterfall as it is Attacq’s unique enabler for delivering future growth. The development offers a unique mix of office, hotel, light industrial and residential prime spaces, ideally located between Johannesburg and Pretoria. Our development pipeline includes the Waterfall Corporate Campus Office Park, the new Courtyard Hotel and the exciting Ellipse residential development”, said Hamman. One of Attacq’s four key value drivers is the investment in MAS, where the company held 22.8% at reporting period. During the six-month period ended 31 December 2018, Attacq received cash dividends of R97.3 million from MAS. Despite being only 3.1% of total gross assets, the performance of Attacq’s Rest of Africa retail investments was disappointing as a result of challenging economic conditions. The decline in the investment value was the result of an impairment of R370.2 million. The group is targeting dividend growth of between 7.5% and 9.5% for the 2019 financial year; which is in line with the guidance communicated at September 2018. The unaudited guidance is based on the assumption of achieving the forecasted rental income, based on contractual terms and anticipated market-related renewals; the Edcon structure commencing on 1 April 2019; the expected roll out of the current and budgeted development portfolio; MAS paying its 2019 interim dividend; and no unforeseen circumstances, such as major corporate tenant failures or material macro-economic instability. Attacq Ltd is a premier Real Estate Investment Trust (REIT), founded in 2005 and listed in the Johannesburg Stock Exchange (JSE) in 2013. It is the owner and manager of a high-quality property portfolio of assets worth over R28 billion in total asset value and is the property developer of the iconic Waterfall node. Attacq’s vision is to deliver exceptional and sustainable growth through its real estate investments and developments in Waterfall City, Waterfall Logistics Hub and retail and mixed-use precincts. Property sectors include retail, office and mixed-use, light industrial and hotel, while the iconic Mall of Africa and PwC Tower are also amongst Attacq’s premium assets. Bolstered by its four key value drivers, namely (1) the South African portfolio, (2) developments at Waterfall (3) its investment in MAS Real Estate Inc. (which has a presence in Western Europe and Central and Eastern Europe), and (4) the rest of Africa retail investments, Attacq is firmly positioned to become one of the country’s preeminent REITS, offering both sustainable income distributions and capital growth. 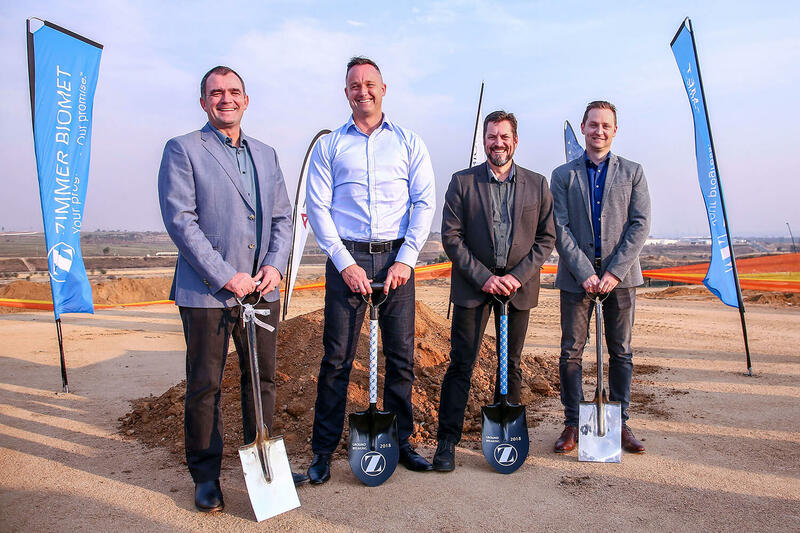 6th September 2018 Attacq Limited (Attacq), the JSE listed property company developing Waterfall City and Waterfall Logistics Hub, hosted an official ground-breaking ceremony today, to welcome international medical devices company Zimmer Biomet to Waterfall Distribution Campus. Waterfall is the latest growth node of Gauteng, the economic hub of the African continent. Poised to be the new CBD of Gauteng, the largest urban concept development – Waterfall offers the ultimate work-life balance. Waterfall is rapidly developing into a true lifestyle and blue-chip business destination between the metropoles of Johannesburg and Pretoria. Waterfall City, the CBD of Waterfall is conveniently located at the Allandale Road exit. This new commercial hub of Gauteng boasts the largest single-phase mall in Africa, appropriately named The Mall of Africa. At Waterfall, the state-of-the-art spatial design is taken to the next level. Beautiful green surroundings provide the ideal setting to live, work and play. Green building design and many lifestyle features, including running lanes and a luscious green park, ensures the enjoyment of nature as part of this modern destination development. Good visibility and accessibility makes Waterfall Logistics Hub an attractive location for ultra-modern light and high-tech industrial, logistics and distribution business. The ability to have cross-functional teams on one site enables seamless collaboration, improved productivity and increased customer satisfaction. Among the leading brands that have made Waterfall their home are PwC, Deloitte and Dimension Data. The BMW Group SA’s purpose-built regional distribution facility has been completed, with the location providing a strategic servicing advantage. Waterfall also has an impressive track record of securing large-scale deals and delivering high-quality, purpose-built developments. Attacq Ltd is a premier Real Estate Investment Trust (REIT), founded in 2005 and listed on the Johannesburg Stock Exchange (JSE) in 2013. It is the owner and manager of a high-quality property portfolio of assets worth over R28 billion and is the property developer of the iconic Waterfall node. Bolstered by its four key value drivers, namely (1) the South African portfolio, (2) the Waterfall development (3) an investment in MAS Real Estate Inc. (which has a presence in Central and Eastern Europe), and (4) the rest of Africa retail investments, Attacq is firmly positioned as one of the country’s pre-eminent REITS, offering both sustainable income distributions and capital growth. 29, May 2018: Attacq Limited, (“Attacq”), the JSE listed property company, announced its conversion to a Real Estate Investment Trust (“REIT”), effective 29 May 2018, following approval by the JSE. Attacq was founded in 2005 and listed as a property company on the JSE in 2013. The intention to convert to a REIT formed part of the revised strategy as announced to the market on 13 June 2017. Attacq is targeting a maiden dividend payment of 73 cents per share, payable in October 2018, for the financial year ended 30 June 2018. Shareholders are advised that the dividend meets the requirements of a “qualifying distribution” for the purposes of section 25BB of the Income Tax Act, No. 58 of 1962 (“Income Tax Act”). The distribution on the shares will be deemed to be a dividend for South African tax purposes, in terms of section 25BB of the Income Tax Act. The dividend received by or accrued to South African tax residents must be included in the gross income of such shareholders and will not be exempt from income tax (in terms of the exclusion to the general dividend exemption, contained in paragraph (aa) of section 10(1)(k)(i) of the Income Tax Act) because it is a dividend distributed by a REIT. “With our vision to be a premier property company, we remain focused on our four value drivers namely our South African portfolio, Waterfall development pipeline, investment in MAS Real Estate Inc., and our retail investments in the rest of Africa,” concluded Hamman. Attacq is a premium quality property company in the real estate sector, founded in 2005 and listed on Johannesburg Stock Exchange in 2013. It acquired the Waterfall development rights in 2008. Attacq delivers exceptional and sustainable growth to its investors through its strategic property holdings and developments and has a total asset value of more than R28 billion and a market capitalisation of more than R13.61 billion (as at 28th May 2018). Attacq has a quality investment portfolio that includes landmark commercial and retail property investments and developments, a 22.7% stake in MAS and is known for its development and management of Waterfall City – Gauteng’s new integrated city that works. The super-regional shopping centre, Mall of Africa (80% Attacq-owned) opened on 28 April 2016 as the largest first phase mall development on the continent and is a benchmark retail destination located in Waterfall City. 24 April 2018. Attacq Limited, (Attacq), the JSE listed property company developing and managing Waterfall, is excited to celebrate the 2-year milestone of its flagship development, Mall of Africa. Mall of Africa is Waterfall’s largest investment to date and has already achieved great success in the early stages of its existence. The Centre’s extensive offering and varied tenant register has continued to attract consumers across the country, achieving a turnover growth of 11% year on year increase for the month of December 2017, solidifying the Mall of Africa as the chosen location for friends and family to spend quality leisure time together. The notable opening of the distinguished PwC tower has also resulted in an impressive foot count upsurge since January 2018, further demonstrating the malls’ ability to attract and retain consumers across multiple demographics. The Mall of Africa’s performance, despite a weaker South African economy that has seen competitors retail assets take severe knocks, has ensured that it has been able to secure impressive new brand name tenants. In fact, in the last six months of operation, the Centre has accommodated wide-ranging international and local powerhouse retailers, restaurant groups and speciality stores. A total of sixteen new stores have come to call Mall of Africa home, which includes prestigious brands such as Michael Kors, Emporio Armani, Tommy Hilfiger and Levinson’s; trendy fashion and footwear stores Refinery, The Fix, Superdry, Hurley and Ramsey; and speciality stores like Bargain Books, Toys R Us, Babies R Us and Maverick & Jane are just a few of the new tenants housed at this exceptional establishment. “Essentially, we want Mall of Africa to become the home of African luxury. We are inviting various world-class brands to South Africa. We aim to build mutually beneficial relationships that will positively impact the state of our economy and believe that we are well on our way to achieving that – one step at a time,” said Johann Fourie, General Manager at Mall of Africa. Collaboration is key to business success. Partnering with African Fashion International ensured Mall of Africa become the official hosts of the Mercedes Benz Fashion Week Johannesburg event, which is widely considered to be one of the most important events of the South African Luxury Fashion Calendar. Mall of Africa is also currently home to the Julie Miller Investment Art Institute’s Africa’s Art Collective, which is the largest of its kind in the country and includes over 200 art pieces on display in the Centre. Furthermore, Mall of Africa’s association with the National Antiques and Decorative Arts Faire (NAADA) has heralded a resurgence in the antiques market. The ‘Faire’ is staged to showcase the best of South Africa’s Classic art and décor and provides attendees with an invaluable and memorable art experience. Attacq is a premium property company in the real estate sector, founded in 2005 and acquired the Waterfall development rights in 2008. The company listed on the Johannesburg Stock Exchange in 2013. Attacq delivers exceptional and sustainable growth to its investors through its strategic property holdings and developments and has a total asset value exceeding R28.2 billion and a market capitalisation of R14.80 billion (as at 5 April 2018). Attacq has a quality investment portfolio that includes landmark commercial and retail property investments and a 22.7% shareholding in MAS Real Estate Inc.
14 March 2018: Attacq has announced the appointment of Giles Pendleton to the role of Head of Developments, effective from the 13th of March 2018. Pendleton brings with him a wealth of experience in general management, commercial property development, operational administration and engineering, from roles in both public and private sector property development across the globe. With 22 years of global experience in Africa, Australia, Asia, Europe and the Middle East, Pendleton will add significant value to Waterfall’s future-looking strategy. He joins the company from a role as the Development Director for the Dubai International Financial Centre’s (DIFC) 225 000m2, mixed-use complex that includes the 60 storey Rosewood Hotel. Prior to that, he was Vice President of Property Development and Head of Master Planning for the Dubai International Financial Centre Authority (DIFCA), a $25 billion, leading international financial hub for the Middle East, Africa and South Asia (MEASA) region. Pendleton started his career in South Africa working for a number of well-known property sector companies in multiple roles. This included working as Head of Property Development at Vukile Property Fund, a R18billion retail-centric, listed REIT. At Vukile, he led the creation of alternative asset classes focused on developing hospitals and medical facilities, student accommodation and high-rise residential buildings. Pendleton also served as the Managing Director of Development at Liberty Properties, which is considered one of the largest real estate developers in Africa. Here he focused on new retail, mixed-use high-rise developments and the greening of existing assets. Furthermore, at Liberty, he was not only responsible for managing the R4 billion of new development work in South Africa, but Pendleton also oversaw the R36 billion Liberty Property Portfolio. Pendleton is an eminent member of the Royal Institute of Chartered Surveyors (RICS) and is one of only eight South Africans to have become a Fellow of the Royal institute of Chartered Surveyors (FRICS). Attacq is a premium quality property company in the real estate sector, founded in 2005 and acquired the Waterfall development rights in 2008. The company listed on the Johannesburg Stock Exchange in 2013. Attacq delivers exceptional and sustainable growth to its investors through its strategic property holdings and developments and has a total asset value exceeding R28.2 billion and a market capitalisation of R14.3 billion (as at 5 March 2018). Attacq has a quality investment portfolio that includes landmark commercial and retail property investments and a 22.7% shareholding in MAS Real Estate Inc. Mall of Africa (80% Attacq-owned) opened on 28 April 2016, as the largest first phase mall development on the continent and a benchmark retail destination located in Waterfall City. Waterfall is the latest growth node of Gauteng, the economic hub of the African continent. Poised to be the new CBD of Gauteng, the largest urban concept development – Waterfall offers the ultimate work-Life balance. Waterfall is rapidly developing into a true lifestyle and blue-chip business destination between the metropolises of Johannesburg and Pretoria. Waterfall City, the CBD of Waterfall is conveniently located at the Allandale Road exit. This new commercial hub of Gauteng boasts the largest single-phase mall in Africa, appropriately named The Mall of Africa. Boasting over 300 shops, with substantial anchor tenants and a carefully selected retail mix, Mall of Africa offers a shopping experience like no other, ensuring a well-balanced variety of local and leading international brands. At Waterfall, the state-of-the-art spatial design is taken to the next level. Beautiful green surroundings, provide the ideal setting to live, work and play. Green building design and many lifestyle features including running lanes and a luscious green park, ensures the enjoyment of nature as part of this modern destination development. Good visibility and accessibility makes Waterfall Logistics Hub an attractive location for ultra-modern light and high-tech industrial, logistics and distribution business. The ability to have cross-functional teams on one site enables seamless collaboration, improved productivity and increased customer satisfaction. Among the leading brands that have made Waterfall their home are PWC, Deloitte and Dimension Data. The BMW Group SA’s purpose-built regional distribution facility has also been completed, with the location providing a strategic servicing advantage. Waterfall also has an impressive track record of securing large-scale deals and delivering high-quality, purpose-built developments. ▪ Gearing ratio improved from 41.4% to 36.2% year-on-year. Tuesday, 27 February 2018. Attacq Limited, (“Attacq”), the JSE listed property company, developing Waterfall City and Waterfall Logistics Hub, today announced interim results for the six months ended 31 December 2017. Adjusted NAVPS for deferred tax increased by 10.1% from R21.35 to R23.51 and NAVPS by 9.5% from R18.77 to R20.56 during the reporting period. The group generated distributable earnings per share of 38.9 cents for the six months to 31 December 2017. “As we transition to a REIT, we remain focused on our four value drivers namely our South African portfolio, strategic investment in MAS, Waterfall development pipeline and our retail investments in the rest of Africa while ensuring that we deliver sustainable growth and unlock shareholder value. Our REIT conversion is paramount, shifting our focus from providing capital growth to a focus on total return comprising distributions and capital growth. This should allow for enhanced share liquidity, lower gearing cost and share price rerating,” commented Melt Hamman, Interim CEO of Attacq. River Creek, the new Deloitte head office in Waterfall City, and Cummins in the Waterfall Logistics Hub were under development as at 31 December 2017. These two developments will increase the total completed Primary Gross Lettable Area (“PGLA”) at Waterfall by 58 732 m². Over the last six months the team concluded a total amount of 92,456m² of leases for new office and industrial space. With five buildings having been completed during the reporting period, the development pipeline within the Waterfall portfolio remains strong. Construction commenced on the Pirtek and speculative warehouse development post the reporting period, with an estimated total PGLA of approximately 8 121 m², valued at an estimated R75.5 million. Attacq, through two 50/50 joint ventures with Barrow Properties and Zenprop, are developing the mixed-use, The Atria, development and Waterfall Corporate Campus Office Park. Once completed, these two developments will increase the completed Waterfall developments with an additional 71 348 m² PGLA. Attacq has a quality diverse South African portfolio across sectors with 52.6% in retail, 37.0% in office and mixed-use, 8.0% in light industrial and 2.4% in the hotel sector. During the last six months the weighted average lease expiry (“WALE”) profile increased from 6.4 years to 6.7 years. Overall portfolio vacancies, measured in terms of PGLA, increased by 18 130 m² when compared with 31 December 2016. Subsequent to 31 December 2017, 10 744 m² of this vacant space was let, reducing the overall vacancy rate to 3.2%. Vacancies that were filled post 31 December 2017 relate mainly to Gateway West (9 403 m²) and Corporate Campus (947 m²). As at 31 December 2017, Attacq’s shareholding in MAS Real Estate Inc (“MAS”) was 22.7% down from 30.6% as at 31 June 2017, due to two MAS capital raises in September and December 2017 in which Attacq did not participate. The market value of Attacq’s investment in MAS, using the MAS closing price of R22.80 per share as at 23 February 2018, is R3.3 billion. Attacq delivers exceptional and sustainable growth to its investors through its strategic property holdings and developments and has a total asset value of more than R28.2 billion and a market capitalisation of more than R14.4 billion (as at 23 February 2018). Attacq has a quality investment portfolio that includes landmark commercial and retail property investments and developments, a 22.7% stake in MAS and is known for its development and management of Waterfall City, Gauteng’s new integrated city that works. Mall of Africa (80% Attacq-owned) opened on 28 April 2016, as the largest first phase mall development on the continent and a benchmark retail destination located in Waterfall City, the CBD of Waterfall. 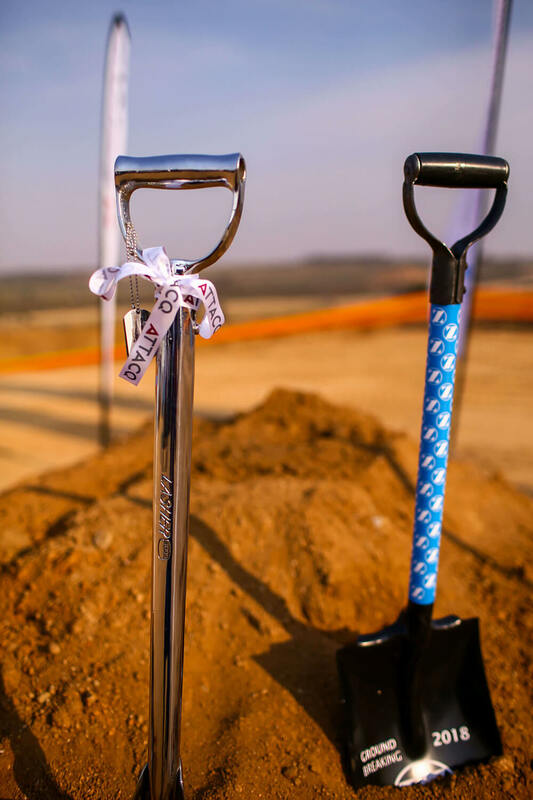 23 November 2017: Deloitte Africa, Atterbury Property and Attacq Limited jointly celebrated the start of construction on Deloitte’s iconic new Africa headquarters, with a sod-turning ceremony onsite at Waterfall City. The 42,500 m² ultra‐modern offices are expected to be completed in the first quarter of 2020, and Deloitte plans to begin operating from its new base from April 2020. Atterbury, a leading South African property investment and development business, and JSE‐listed premier property company, Attacq, are co-owners in a 50/50 joint venture on the development of the new Deloitte premises. While bulk earthworks for the project began in October this year, this sod‐turning ceremony signifies the official commencement of development. Continuing with their flair for creating flagship corporate head offices and top quality real estate assets for leading national and international blue‐chip businesses, Atterbury CEO Louis van der Watt believes that their deep understanding of Deloitte’s operational business needs will ensure the project’s success in the years ahead. The building, which will enjoy prime positioning alongside the Allandale interchange of the N1 highway, has space capacity for close to 5,000 people and promises Deloitte prominent highway frontage at the eastern side of Waterfall City as well as its clients and talent easy and quick access to its premises. The landmark development consists of a ground floor with six stories of offices and four basement parking levels including nearly 2,000 parking bays. Architecture practice Aevitas designed the new Deloitte headquarters to comply with a Silver LEED (Leadership in Energy and Environmental Design) Green Rating on completion. Deloitte’s new environmentally innovative workspace has been designed to create an inspiring atmosphere that promotes productivity and well‐being. The building will also be cost effective and play its part in mitigating the effects of climate change. 26 October 2017, Waterfall. Cummins, the global leader in the design, manufacturing, distribution and servicing of power generation systems, broke ground at their new construction site situated in the heart of Waterfall’s Logistics Precinct. The sod turning ceremony marks the official start of construction for Cummins Southern Africa Regional Offices (CSARO). The 15 000 m² facility comprises of a service centre, engine rebuild centre, warehouse with specialist installations and office space and will be completed in October 2018. The building will allow Cummins to consolidate its operations in the region by bringing its Master Rebuild Centre, Gauteng Operations Workshop and Southern Africa Technical Training Centre all under one roof. “This new facility will help bolster our operations in Southern Africa through the greater overall efficiency that comes from combining multiple activities under one roof. Furthermore, the benefit of having our office and servicing centres in the same location streamlines operations, enabling us to deliver even better on our promise of excellent customer service and support,” said Thierry Pimi, MD of Cummins Southern Africa. Waterfall’s Logistics Precinct, visible from the N1 and Allandale interchange, provides state of the art warehouses, distribution centres and offices. The campus’ strategic location provides unparalleled ease-of-access to national logistics routes and transit infrastructure. “We are excited about embarking on this journey with Cummins and believe that, once complete in November 2018, the Cummins Southern Africa building will be a pioneering development within our logistics hub. We welcome Cummins and are thrilled they chose a home with us,” said Pete Mackenzie, Head of Development at Attacq. Waterfall City, the CBD of Waterfall is conveniently located at the Allandale Road exit. This new commercial hub of Gauteng boasts the largest single-phase mall in Africa, appropriately named The Mall of Africa. Boasting over 300 shops, with substantial anchor tenants and a carefully selected retail mix, Mall of Africa offers a shopping experience like no other. Over 99% of available retail space has been let to date, ensuring a well-balanced variety of local and leading international brands. Good visibility and accessibility makes Waterfall Logistics Hub an attractive location for ultra-modern light and high-tech industrial, logistics and distribution business. The ability to have cross-functional teams on one site enables seamless collaboration, improved productivity and increased customer satisfaction. Among the leading brands that have made Waterfall their home is promotional provider Amrod and Dimension Data. The BMW Group SA has commenced work on its purpose-built regional distribution facility, with the location providing a strategic servicing advantage. The location has an impressive track record of securing large-scale deals and delivering high-quality, purpose-built developments. Attacq Limited (Attacq) today announced that Melt Hamman, the company’s current CFO, will be appointed as interim CEO, effective from 31 December this year. This interim appointment follows the recent resignation of Director and current CEO, Morné Wilken, who will be taking up a position as CEO of MAS Real Estate Inc., of which Attacq is the major shareholder. Attacq’s Board of Directors has already commenced with the process of identifying and recruiting a new CEO. Hamman joined Attacq from the FirstRand Group during July 2013 prior to Attacq’s listing on the Johannesburg Stock Exchange. Over the last four years he worked closely alongside the current CEO in establishing and positioning the company and will continue to drive Attacq’s ongoing business strategy, together with the current leadership team. He thanked Morné for the pivotal role he played in the success of the business and in particular, the development of the Waterfall precinct. “The Board appreciates Morné’s contribution and wishes him all the best in his future endeavours,” Tredoux said. Johannesburg: 19 September 2017. The annual Attacq Smart Cities Innovation Pitching Platform has officially opened for 2017. Aspiring entrepreneurs now have the opportunity to showcase their innovation and develop future-focused technologies that can bring the ‘smart city’ concept to life at Attacq’s flagship property development, Waterfall City. The platform is for aspiring and emerging entrepreneurs to pitch their smart city business ideas for potential implementation. The applicants stand a chance to win their share of R100 000 for direct business needs or incubation support to the value of R150 000. The contest is open to all aspiring innovators, from student and non-student communities, and applications will close on 29 September 2017. To enter, applicants will need to develop their solution from concept stage and then prove its feasibility to become a viable business. Participants can submit their business ideas in the format of a 3-minute video pitch with no digital presentations, recorded at participating university campuses across the country and entered through a bespoke pitching platform. The participating universities are Stellenbosch University (SU), The University of Western Cape (UWC), The University of Cape Town (UCT), The Cape Peninsula University of Technology (CPUT), The University of Johannesburg (UJ), WITS University, Central University of Technology (CUT) and The University of Pretoria (UP). Alternatively, applications can also be submitted online at the following link: http://www.launchlab.co.za/attacq. Entrants may pitch more than one idea, but only one idea can win! Michael Clampett, Head of Asset Management: Retail at Attacq says, “Attacq was founded by property entrepreneurs looking to put their stamp on the local property market, and that spirit runs through the everyday business of Attacq. In the dynamic retail environment they felt it was necessary to be part of the change, rather than just accepting change when it came to their world class shopping mall portfolio. The initial partnership between the LaunchLab and Attacq has proved to be very successful and they are very excited to turn their focus in innovation toward the idea of living in a smart city”. Attacq representatives, experienced entrepreneurs, academics and representatives from the local investor community have been selected as judges and will determine the winning pitch. The final judging event will be hosted at the LaunchLab office, in Stellenbosch, on 16 October 2017. Don’t miss this opportunity to make your business idea a reality – book your pitching slot today, to stand a chance of becoming an innovative driver of a smart urban development in Africa. For more information on the ATTACQ Smart Cities Innovation Challenge or to sign up, visit www.launchlab.co.za/attacq or email info@launchlab.co.za. The pitching platform is available at participating university campuses around the country namely; Stellenbosch University (SU), The University of Western Cape (UWC), The University of Cape Town (UCT), The Cape Peninsula University of Technology (CPUT), The University of Johannesburg (UJ), WITS University, Central University of Technology (CUT) and The University of Pretoria (UP). Attacq’s vision is to be the premier property company in South Africa. Attacq pursues this vision through its strategic pillars of invest, develop and grow. Attacq was founded in 2005 and listed on the Johannesburg Stock Exchange in October 2013. The company has a total asset value of more than R27.1 billion as at December 2016 and is currently transitioning to a REIT. LaunchLab is a network of University campus-based business incubators. An initiative of Innovus, Stellenbosch University’s industry interaction and innovation company, LaunchLab is a mixed-use business incubator that supports mainly technology and innovation businesses. It seeks to add value to its residents and to differentiate itself from other business incubators through programmes designed to develop an ecosystem that accelerates entrepreneurs and businesses to a new level. For more information, visit www.launchlab.co.za. Market value of investment in MAS Real Estate Inc (“MAS”) increased by 18.9% to R3.5 billion. Tuesday, 12 September 2017. Attacq Limited, (“Attacq”), the JSE listed property company, developing Waterfall City and Waterfall Logistics Hub, today announced annual results for the year ended 30 June 2017. Adjusted NAVPS increased by 3.2% from R21.89 to R22.59 and NAVPS by 3.2% from R19.23 to R19.84 year-on-year. Attacq’s portfolio comprises a quality South African operational portfolio, its Waterfall development portfolio, strategic investment in MAS and retail investments in the rest of Africa. “The growth in our net asset value per share was negatively impacted by the strong Rand, marked-to-market losses on our interest rate swaps and impairments on certain investments in the rest of Africa and Central Europe. This was countered by growth in our quality South African portfolio, the completion of a further 4 properties in Waterfall and the strategic investment in MAS,” commented Morné Wilken, CEO of Attacq. Attacq has a diverse South African portfolio across sectors with 58.6% in retail, 33.8% in office and mixed-use, 5.2% in light industrial and 2.4% in the hotel sector. At the end of the reporting period, the current weighted average lease expiry profile was marginally lower at 6.4 years compared to 6.7 years in 2016. Overall portfolio vacancies, measured in terms of primary gross lettable area (“PGLA”), increased by 4 690 m² to 3.0%. After year end 4 431 m² of PGLA was let, reducing vacancies as a percentage of total PGLA to 2.4%. During the year four newly developed buildings were added to the portfolio, increasing the value of the existing South African operational portfolio to R18.1 billion from R17.1 billion. Net rental income, including straight-line lease income adjustments, increased by 17.9% to R1.3 billion. A year-on-year comparison of the net rental income is however less meaningful, due to the four buildings that were completed during the current year and the inclusion of the Mall’s operational results for only two months in the previous financial year. “The disposal of our Serbia and Cyprus investments, the shareholding in Nova Eventis post year end as well as some mature, non-core assets in South Africa formed part of our repositioning. The proceeds from the disposals were used to reduce our debt in preparation for our REIT conversion,” stated Wilken. Gearing, calculated as total interest-bearing debt less cash on hand as a percentage of total assets, improved from 39.9% to 37.1% year-on-year. The weighted average cost of funding remained flat over the last 12 months at 9.2% (2016: 9.2%). “At year end 90.8% of our debt was fixed by way of fixed interest rate loans and interest rate swaps across debt providers. Our interest rate hedging policy remains conservative and forms part of our risk mitigation strategy. We have also embarked on a process of amending our existing debt facilities to interest only facilities. We believe we are well positioned to navigate the current uncertain macro-economic and political environment,” said Melt Hamman, CFO of Attacq. Waterfall’s location and ease of access create an attractive value proposition for the creation of a new city in the centre of Gauteng, i.e. Waterfall City, an integrated city that works, as well as the Waterfall Logistics Hub – Gauteng’s logistic hub of choice. Attacq has approximately 1 million m² of remaining developable bulk in the Waterfall area. This bulk is ungeared and 608 000 m² is already serviced and ready for the value accretive roll out of commercial, residential and industrial developments. The Waterfall development portfolio value increased by R202.9 million to R3.6 billion, comprising 13.0% of total gross assets. “The Mall performed well during its first full year of trading. It has created over 4 000 permanent jobs and has generated an average monthly trading density of R2 564 m² during the financial year. During the reporting period, we focused on right-sizing the Mall and plan to introduce a number of new tenants, including international brands, over the coming months. Our active asset management continues and our aim is to enhance our entertainment offering further increasing dwelling time at the Mall,” said Wilken. As at 30 June 2017, Attacq’s shareholding in MAS was 30.6% down from 41.4% as at 30 June 2016, mainly due to a MAS capital raising in March 2017 in which Attacq did not participate. The market value of Attacq’s investment, using the 30 June 2017 MAS share price of R23.50, equates to R3.5 billion representing an annual pre-tax capital growth of 18.9%. During the financial year Attacq received a R105.3 million dividend from MAS which represents a 3.6% income return, based on the June 2016 market value. The conservative value of Attacq’s rest of Africa retail investments was R1.2 billion (2016: R1.4 billion), comprising 4.5% (2016: 4.9%) of total gross assets. The net reduction over the year was due to Rand appreciation and further impairments. Attacq is currently not looking at increasing its investments in the rest of Africa. Attacq is targeting a maiden dividend payment from its income-producing assets, namely the existing quality operational portfolio and MAS investment, of 73 cents per share for the year ended 30 June 2018, with a 20% growth per annum in its distributions for the next three years. The guidance is based on assumptions which include the expected roll-out of the current and budgeted development portfolio, MAS achieving its distribution targets, the required positioning to become a REIT and no unforeseen circumstances such as major corporate tenant failures or macro-economic instability. “Our valuation is the sum of the parts comprising income and capital returns through our quality South African portfolio and investment in MAS, as well as capital returns through our Waterfall development and retail investments in the rest of Africa, offering a unique total return value proposition as a company that will develop and own a City,” concluded Wilken. Attacq delivers exceptional and sustainable growth to its investors through its strategic property holdings and developments and has a total asset value of more than R27.3 billion and a market capitalisation of more than R13.9 billion (as at 8 September 2017). Attacq has a quality investment portfolio that includes landmark commercial and retail property investments and developments, a 30.6% stake in MAS and is known for its development and management of Waterfall City, Gauteng’s new integrated city that works.